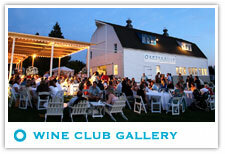 Oswego Hills is proud to offer exclusive membership in our wine club. As we have grown steadily over the years, our demand has increased as well. As a result, we are now allocating several of the wines we produce. It's exciting to note that with the coming vintage, we are now producing 16 different wines. Although some of these are in limited production, we will have all of them available through the wine club. The depth and range of our wine offerings will make this club an extremely worthwhile investment. Throughout the year, each member will receive 4 shipments containing 6 bottles of wine. You will also receive a membership card, quarterly newsletter, and an invitation to our annual wine club dinner party which we host on the Saturday of Labor Day Weekend. Members also enjoy the benefit of a minimum 25% discount on additional wine purchases along with seasonal specials for our most current releases. Memberships run from January 1st on a year to year basis with an annual cost of $450.00. Joining the Oswego Hills Wine Club guarantees you access to any of these wines you may choose to stock your cellar. Membership will be limited to 150 people.